It doesn't smell or taste like a marshmallow, but the fruit of mallow does resemble a little wheel of cheese with a hole in the middle. And it’s not just the fruit that is worth collecting: the fresh leaves and tiny flowers also have culinary potential. 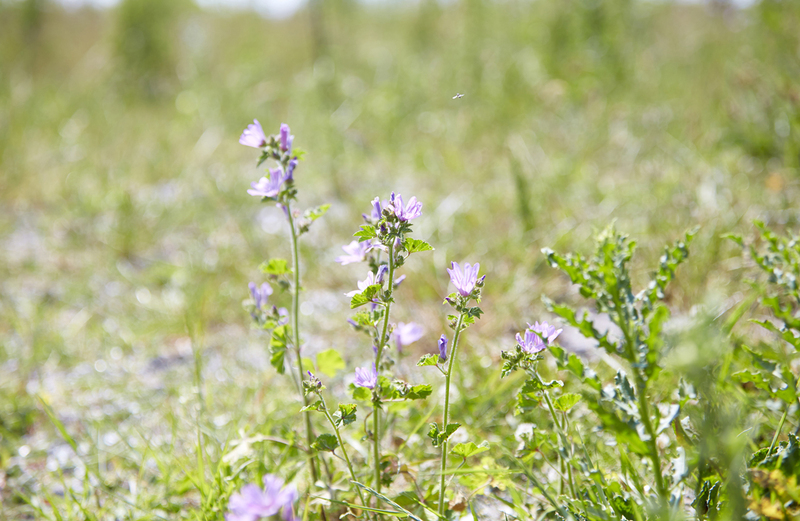 Mallows need sunlight, so look for it in open areas, at the edge of the woods, and near roadsides and beaches. It craves soil that is slightly dry and rich in lime. Often you will also find mallow near human settlements— in harbor areas, for example, or on waysides. It is also planted in many gardens and parks. 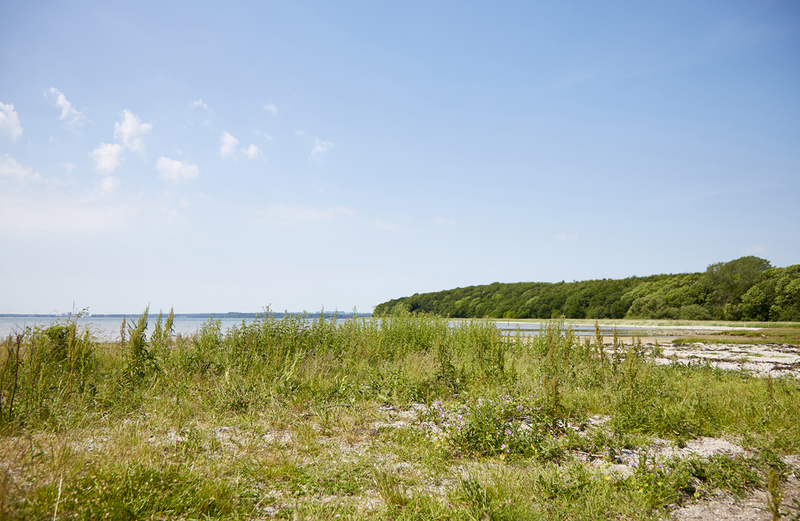 Mallow grows freely across most of Denmark, but is less common in northern, central, and western Jutland. Collect the leaves in May and the flowers from June until the first days of August. You can harvest the unripe seeds in July and August. Leaves: May. Flowers: June, July, August. Unripe seeds: July, August. Mallow grows up to a meter tall. From July to September it bears dark reddish-purple flowers that grow together in bunches of two to six. Each flower is composed of five petals, and each petal has three dark red stripes running down its length. They look a bit like hollyhocks. The leaves are sawtoothed and kidney-shaped; they spread from an upright stem, which is rough and hairy. 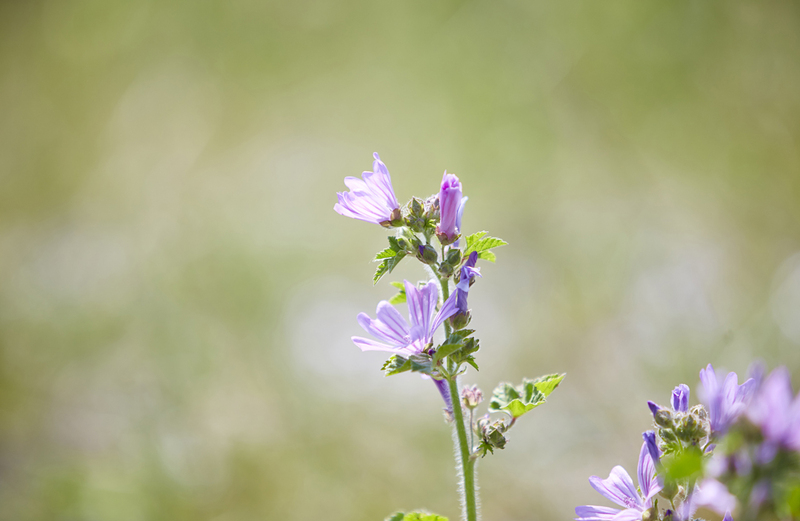 Use a knife or scissors to cut mallow leaves and flowers from their stalks, and be careful not to pull up the root. You can also gather the green, unripe seeds. The leaves and flowers of mallow are sweet, with a mild pea flavor and a consistency like okra—when you chew them, they get slimy. The unripe fruiting heads taste like fresh hazelnuts. The seeds are fresh and crisp. Mallow has a mildly floral scent. You can eat the leaves and flowers raw or dried. The leaves release slime when cooked, making them useful for thickening stews. Make tea from the dried leaves and flowers or use the young, fresh leaves and flowers in salads. The flowers also make pretty decorations for cakes and other desserts. Add the leaves and flowers to vegetable soups, ragouts and casseroles, where they will impart flavor and depth, as well as acting as a thickening agent. Store the mallow in a sealed bag or airtight container inside the crisper drawer of your refrigerator, where it will keep for up to ten days. The flowers can be replaced with cornflowers or the leaves of the sea beet. Mallow can easily be confused with other types of mallow that are also edible. There is no risk of mistaking the plant for another dangerous or undesirable plant.